Intro: Baron Brewing is located in Seattle and is known for their German-style beers. Their brewery is located in the South Park neighborhood, and you can find many of their beers around Seattle and at the brewery-affiliated Pillager’s Pub in Greenwood. Description: Dark brown with a hint of red. Thin head. Tastes of chocolate, light caramel, Belgian spice, bananas and has a minimal bitter finish. Medium body and drinks pretty light for it’s 8.2% ABV. No sour fruit in my glass, as some of the reviews on BA and RB note. Not that I need a higher ABV on this, but it really does seem a bit subdued. Availability: Available in 22oz bottles at local Seattle bottle shops year-round. 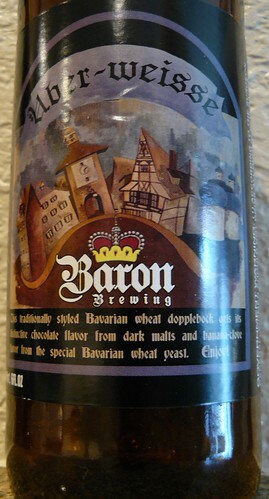 The Baron Über-Weisse is a Bavarian style Weizenstarkbier (wheat doppelbock). It has a dark, rich hue with a full, creamy head. Aroma of banana and chocolate notes. Velvety in texture with flavors of roast, chocolate, banana and sweet malt. Finishes mildly tart from the wheat, while ending dry and clean. Brewed with over 60% wheat and aged for roughly four months to ensure its smooth, complex taste. All ingredients for the beer are imported from Germany. Brewed in accordance to the German Beer Purity Law (Reinheitsgebot) of 1516.